BEIJING—China's labor market has so far proved resilient despite a slowing economy, but that means little to recent college graduate Wu Xiuyan. "My classmates and I want to find jobs in banks or foreign-trade companies, but the reality is that we can't find positions that match our education," said Ms. Wu, 24 years old, who graduated in June from Zhejiang University of Finance and Economics. She has spent the time since then living at home and trawling recruitment websites. "I just want a stable, maybe administrative, job," she said, "but why is it so hard?" China has shown little evidence of rising unemployment despite the slowest growth rate since the global financial crisis—and is nowhere near the jobless rates seen in some of the countries hardest hit by the euro-zone debt crisis. But slowing growth underscores a fundamental challenge to China's economic development: the underemployment of huge numbers of graduates that Chinese colleges are churning out. Experts say that many of the graduates lack skills such as critical thinking, foreign languages and basic office communications that businesses are looking for. Even small private enterprises that offer humble salaries find many graduates unsatisfactory. "Those small sales companies that desperately need people also reject us graduates," said Ms. Wu. "They say we don't have social resources or work experience that they need." At the same time, China has made only limited gains in remaking its economy so it relies more on services and innovation and less on construction and assembly-line manufacturing. That limits the markets for the lawyers, engineers and accountants that Chinese universities are producing. As a result, many graduates find they can get only low-skill jobs that pay far less than they imagined they would make and see a future of limited prospects. A survey of more than 6,000 new graduates conducted last year by Tsinghua University in Beijing said that entry-level salaries of 69% of college graduates are lower than those of the migrant workers who come from the countryside to man Chinese factories, a figure that government statistics currently put at about 2,200 yuan ($345) a month. Graduates from lower-level universities make an average of only 1,903 yuan a month, it said. Li Junjie graduated in June from Communication University of China, majoring in broadcast journalism. "It is getting even harder for us to get a job than the previous graduates of my major because fewer positions are left for me and my classmates," said the 23-year-old native of southern Guangdong province, who is staying with friends in Beijing as he looks for work. "Media outlets here look for professionals or native English speakers, not fresh Chinese graduates with only a diploma." While worker dissatisfaction hasn't manifested itself politically, such as in public protests, it is bound to be a worry for China's top leaders who regularly stress the need to avoid social instability, particularly ahead of this fall's leadership change. Economically, China's productivity gains could slow if it can't better match the demand of its current job market and the skills of its graduates. China's universities have churned out more than 39 million graduates with undergraduate or specialized degrees over the past decade, according to the Ministry of Education. 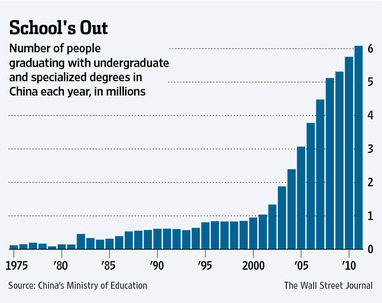 People with some college education now account for about 8.9% of China's population, according to 2010 government data. While that's a much smaller proportion than the 36.7% of the adult population in the U.S, it's a sharp rise from China's 3.6% in 2000. The employment rate of China's college graduates last year was 90%, according to a survey by the Chinese Academy of Social Sciences and MyCOS Research Institute, a Beijing-based education consulting firm. But only 47% of the 256,000 Chinese graduates surveyed said they feel satisfied in their current job. "To solve the underemployment problem, you need to adjust the economy for the workforce that China has now," said Chetan Ahya, an economist and managing director at Morgan Stanley. "A comprehensive approach is needed to create jobs with high value." "High-end jobs that should have been produced by industrialization, including research, marketing and accounting etc., have been left in the West," said Chen Yuyu, associate professor at Peking University's Guanghua School of Management. Referencing the trade name of Hon Hai Precision Industry Co., 2317.TW +0.69% the Taiwan-based company that makes gadgets for Apple Inc.
AAPL +0.09% and others in Chinese factories, he said, "We only have assembly lines in Foxconns." Solving the problem is complex, involving a gradual overhaul of China's education system as well as efforts to add more service-sector jobs. China's Ministry of Education in 2010 unveiled new guidelines pressing universities to shift away from their traditional focus on increasing enrollment. It is also experimenting with giving faculty greater say over curriculum and school operations, though universities remain tightly controlled by the Communist Party. A large population of college-educated workers with ambitions for better jobs could have long-term advantages, economists say. Educated labor could make China more appealing to both foreign and domestic companies hoping to add service-oriented jobs in China. The group so far also seems less likely to stir unrest than migrant workers, who in recent years have staged protests in some areas over low pay and other issues. "The underemployment is more a short-term problem," says Albert Park, professor of Economics at Hong Kong University of Science and Technology. "The demand will be there for China's graduates." A version of this article appeared August 22, 2012, on page A12 in the U.S. edition of The Wall Street Journal, with the headline: China's Graduates Face Glut.